Since my step-mother broke a leg and a wrist yesterday, I began to treasure my ability to take a walk (and brush my hair). I am reminded not to take one thing for granted. I began to think about all the things she won’t be able to do for a while. She is right-handed and broke the right wrist. Have you ever tried to apply lipstick with “the other hand” and not get it on your nose? 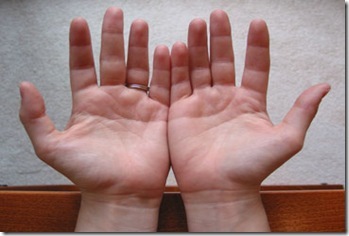 Have you ever tried to feed yourself with the “other hand?” Now there’s a good weight loss tip. 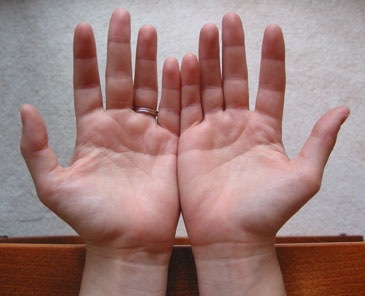 Just for today, try using “the other hand” and be grateful for small miracles. I do hope for Miss Martha a speedy and complete recovery! So sorry to hear of her fall. She is in good hands with my favorite doctor by her side!